So much more than an act, it's an entire show-but a show that can go anywhere, anytime, anyplace-a show that actively involves the audience throughout in the mystery and fun! Glenn's Blindfold Readings - Glenn's world-famous, 17-minute signature Q&A act. This is the act that launched Glenn's career and has kept him on top for two decades! 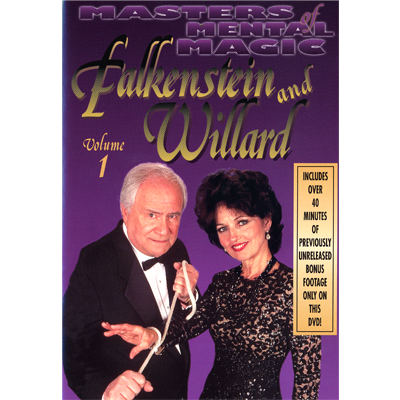 Falkenstein & Willard's Award-Winning Two-Way Mindreading Method - A legacy from "The Great Mardoni's." This act demonstrates a rapport which can be developed between couples. The Gypsy Mystery Rope Escape with volunteer - A smash finish for any show! Full of mystery and fun, can be performed close-up & surrounded. Leaves the audience astonished and laughing. Calls for a volunteer (ideal if the volunteer is a CEO). Interview with Michael and Hannah Ammar - Pay close attention while Falkenstein & Willard share a lifetime of tips on showmanship and the psychology of mentalism which has earned them an international reputation as two of the most highly versatile, world-class exponents of mental magic and spirit theatre.